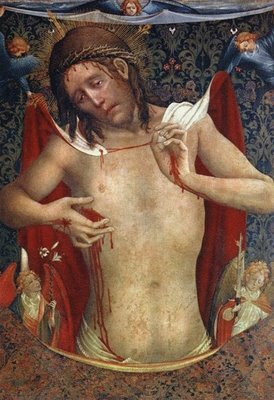 July 1 used to be the Feast of the Most Precious Blood. It’s a good day for us to think about the Blood of Christ. First, a word about liturgical reform. This feast was extended to the universal Church only in 1849. Until sometime in the twentieth century, it was the first Sunday of July; by 1920 it was July 1. It had also sometimes been celebrated on Friday of the fourth week of Lent. In other words, though July 1 is nice – I like to make it a special day of remembrance – it’s not hallowed by any long universal tradition. From time to time in her history, the Church has pruned the liturgical calendar. Over the years, more and more feasts get added – and from time to time, you have to pare them back. Today, for example, the readings at Mass were a rousing call from Amos and the calling of Matthew. When you have too many feasts, you miss your chance for “ordinary” readings like these. If it were up to me, maybe I’d take some of the Italian saints out of the calendar and put this one back in. But it’s not up to me. And one of the splendors of being Catholic is participating in a life that transcends our personal preference. So let’s remember the Precious Blood, but not get too worried about the prudential judgments that, for the time being, have supressed this fairly recent feast. We can appreciate the Precious Blood by considering some ways it is distinct from the Body of Christ. First, it brings out his suffering. When Christ says, “this is my body,” he says something marital. Every spouse gives his body to his bride, and vice versa. That’s nice and happy. But when he says, “this is my blood,” things take a more frightening turn. We don’t want to see our spouse bleed. I like to imagine how wonder turned to shock when, after Christ gave them his body, he then began to speak of his blood – parallel to when Peter professes Jesus as Christ, and then Jesus starts talking about the Cross. Devotion to Christ’s blood is devotion to his suffering. Second, the blood is the completion of the Eucharist. In the consecration, the prayers are unequal. First he says just, “Take this, all of you, and eat of it, for this is my body” – after Vatican II, they added a stronger sacrificial angle, “which will be given up for you,” but the prayer remains simple. There’s a sense, in these prayers, in which the Body is only a prologue for the Blood. The prayers suggest that the Blood is the exciting part: the new and eternal covenant, the mystery of faith, for the forgiveness of sins. The Greek word can be translated two different ways, yielding two complementary theologies. These days, it’s popular to talk about a “covenant,” which is a two-way agreement. In this angle, attention is brought to the Chalice – and the prayers of the Mass do emphasize the container as well as what it contains, down to the mysterious words in the institution narrative of the Roman Canon, “he took this precious chalice in his holy and venerable hands.” This one? The sharing of the chalice is a sign of union, concord, like a peace pipe. It is the reverse of the traditional poison cup: we share the cup, acknowledging that what happens to you (in this case, down to the Cross) happens to me, too. He drinks our cup, we drink his. But another translation of that covenant word, with a lot of Scripture to support it, is “testament.” A testament is a one-way decision: a decision that when I die, you will get what I leave behind. And the Precious Blood is that, too. It is a pointer to his death. And it is a promise of inheritance, an inheritance of life. In Scripture, wine and blood are both double signs: signs of disorientation and death, but also signs of joy and life. With the Blood, he also says, I die, and I give you life: I pour out my blood for you. How do you reverence the Blood of Christ?